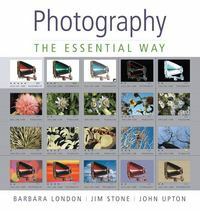 Photography: The Essential Way 1 Edition Photography: The Essential Way is a departure from tradition that moves boldly into the digital age with you. This new book embraces the new photography that is captured, shaped, transmitted, printed, and saved electronically, while retaining coverage of film and its exposure and development. Comprehensive coverage of essential topics such as digital and film cameras, lenses, exposure, sensors and film, and developing black-and-white film.